The Basket of Cheer Bouquet sends your warmest wishes for happiness with each sunlit bloom! 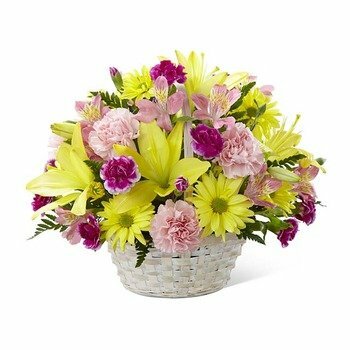 This arrangement is a sweet sentiment brought together to brighen your special recipient's day. * Great selection fair prices and a very excellent web site. * I have used 1st in Flowers for several years and the reason is quite simply that they consistently deliver the most beautiful flowers as promised. There's no hidden extras, no vacuous promises of loyalty rewards, just the real thing each and every time! Theirs is the way to do business and guarantee repeat customers.